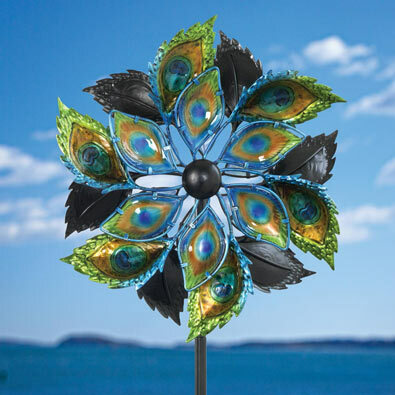 Enhance your yard or garden with our elegant peacock wind spinner. Replicating the multicolor tones of peacock feathers, the inner circle has hand painted reflective glass inserts while the outer circle is made of shimmering metallic metal. A truly magical art piece that will spin in the slightest breeze. Weather resistant ball bearing construction on a powder coated steel stake. 14-1/2" in diameter. Stands 43-1/2" tall, with a 5" fork to adhere to the ground. There's nothing small about this wire and painted glass hummingbird thermometer! 15" x 13" with a 6" diameter thermometer. Keyhole on back for hanging. Our clever duck is ready for the rain with matching rain coat and umbrella. Place him in your garden and he'll track the precipitation. His gauge displays both centimeters and inches (up to 5"). Made of durable poly resin, metal and glass. Measures 9" tall x 5-1/2" wide x 3-1/2" deep.